It was a dark day for Paris which saw its historical monument, the Notre Dame Cathedral go up in flames on Monday, April 15. Many people shared the horrific pictures and videos from the blazing fire which was finally doused after close to 12 hours. Among all the other pictures that saw the structure go up in flames, a photographer Brooke Windsor has shared a picture of a man swinging his child with the landmark in the background and asked social media users to track them down. 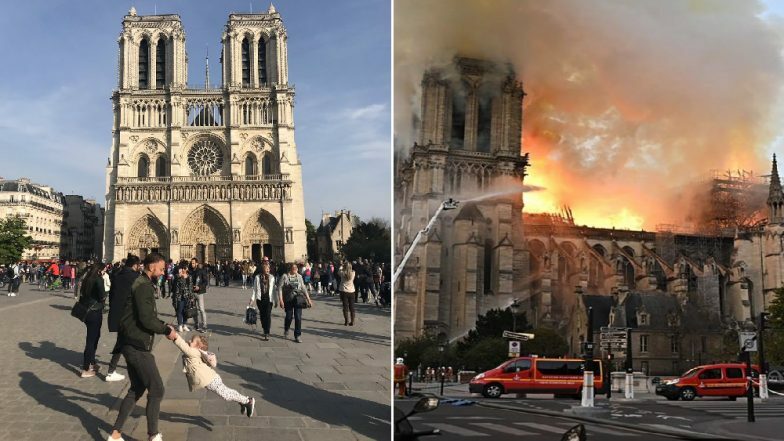 It is a very happy picture of the two smiling as play in front of the Cathedral which caught fire just an hour later. Notre-Dame Cathedral in Paris Goes up in Flames, Know the History And Facts of Famous French Tourist Attraction (Watch Pics and Videos). Brooke Windsor posted the picture on her Twitter and wrote, that she almost thought of asking the supposed dad in the picture if they wanted the picture. But now she wishes she had given them this monumental picture. She asked the internet if they could help her find this little girl and her dad. The picture was taken at 5.57 local time and just an hour later they saw smokes coming out from the direction of the Cathedral. What Is The Fate Of Priceless Treasures From Notre-Dame Cathedral. It is indeed a very happy picture and we are sure its one precious memory for the man and the child. The tweet has been retweeted close to 2 lakh times and we hope the internet does its magic once again.